Ablynx has scored a major hit in phase 3 trials of caplacizumab, a new treatment for a rare blood clotting disorder. Shares in the Belgian biotech have soared on the news, rising 30% this morning on the news. Caplacizumab is now lined up to treat acquired thrombotic thrombocytopenic purpura (aTTP), having already been filed with the EMA in February. Analysts predict the drug will earn global peak sales of $400 million, and the company may opt to go it alone in marketing the drug. If approved, the drug would be the first Ablynx drug on the market, and would represent a turning point for the company, which specialises in next generation biologics called nanobodies. aTTP is a rare, acute, life-threatening, autoimmune blood clotting disorder caused by impaired activity of the ADAMTS13 enzyme, and Ablynx’s drug could advance treatment significantly. However the company won’t have the aTTP market to itself. Shire is also developing a potential competitor, which begun phase 3 development this year and has been granted a ‘fast track’ development process by the US regulator. 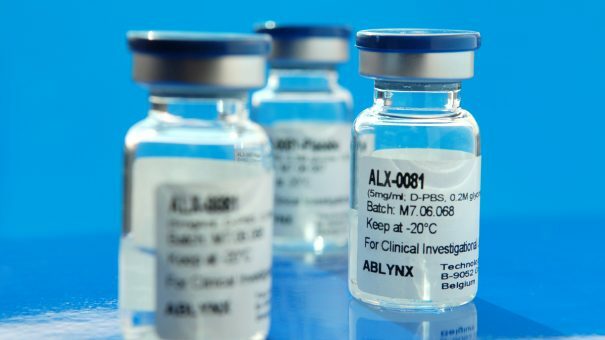 Ablynx said the trial results will help progress the EU filing, and form part of a US filing planned next year, where caplacizumab also has an FDA ‘fast track’ designation. further microvascular thrombosis being prevented. count response at any given time point, compared to patients treated with placebo. Even more promising were secondary endpoint measures: the small antibody drug helped cut aTTP-related deaths by 74%, a recurrence of aTTP or at least one major thromboembolic event during the study. The proportion of patients with a recurrence of aTTP in the overall study period (including the 28 day follow-up after discontinuation of study drug treatment) was 67% lower in the caplacizumab arm compared to the placebo arm, demonstrating the durability of the treatment effect. Serious treatment-emergent adverse events were more common in the placebo group, driven by the percentage of patients experiencing a recurrence of aTTP. As expected the percentage of subjects with any bleeding-related TEAE was higher in the caplacizumab treatment group than in the placebo treatment group. Most bleeding-related TEAEs were mild or moderate in severity. There were three deaths in the placebo group and none in the caplacizumab group during the study drug treatment period. One patient in the caplacizumab group died in the follow-up period after completing the study drug treatment and this was assessed by the investigator not to be related to study drug. The positive phase 3 results follow hot on the heels of another encouraging development, a €2.4bn R&D deal with Sanofi announced last month.